I’ve been a fan of the Oktava MK-012 hybrid condenser mic for years, so I eagerly arranged a demo of the company’s Figure-8 small-diameter capsule head. They actually make two. One is a Fig-8 “adapter,” which enables anyone who already owns a pair of Cardioid SDC capsules to mount them to a T-shaped assembly (see it here). The other is a complete capsule head (pictured at right), which incorporates the capsule elements into a single assembly. This is the one I tried. 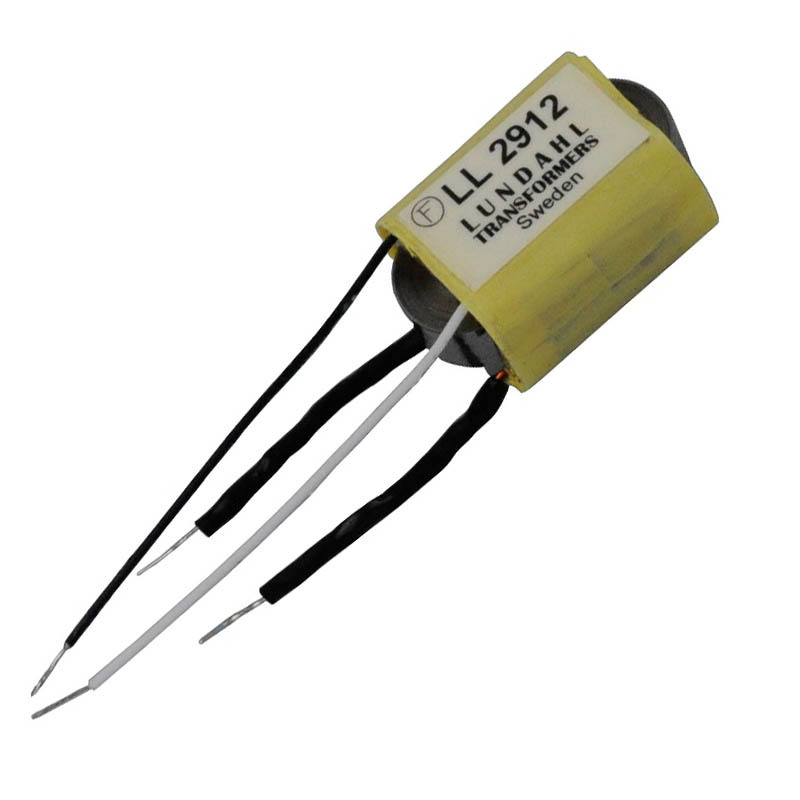 Read on for details on what I think is a great application of this capsule head, with audio samples. The head assembly contains the guts of two single-diaphragm Cardioid capsules, back-to-back. In every Figure-8 condenser capsule, the polarity of one diaphragm is reversed. The effect of this is that soundwaves arriving at both diaphragms simultaneously — such as from 90° — create signals of equal amplitude but opposite polarity, which therefore cancel out. This creates the 90° “nulls” that are characteristic of a bidirectional capsule. I tested the 90° performance of this capsule, compared to the Oktava SDC Cardioid capsule. 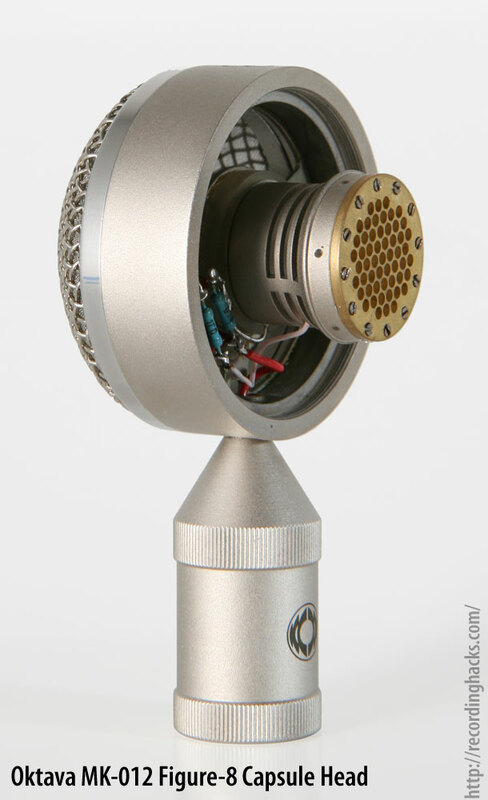 On the same voice passage, the Cardioid capsule dropped only 3dB at 90°. The Figure-8 capsule head dropped over 17dB! This is why Figure-8 mics can be so useful for isolating sources during a session. If you point a Cardioid mic at the hi-hats on a drum kit, the first tom is going to only be 3dB down (assuming it’s at 90° to the mic’s capsule). Swap that Cardioid capsule for the Figure-8, and the first tom will barely be audible in the HH track. Just as with a ribbon mic, point this capsule’s null at whatever sources you don’t want to record, and you’ll get really good isolation. Of course, that’s not the only thing a Figure-8 mic is good for… it’s also required to use the coincident stereo recording technique called Mid-Side. I’ve had great results recording acoustic guitar in stereo, but most of the time I put a single MK-012 (Cardioid) at the 12th fret and call it done. It sounds great, and it’s easy. Miking a guitar in stereo takes a bit more time. Not only do both mics need to sound good on their own, but the pair has to be checked for phase anomalies. Here’s an easier, faster solution. It gives you the stereo spread you want with no comb filtering or placement fussiness. And it allows the amount of stereo ambiance to be adjusted at mix time. Sound too good to be true? Welcome to the magic of mid-side. 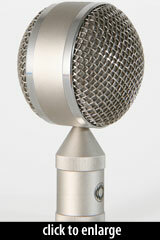 Point a Cardioid mic at your source. 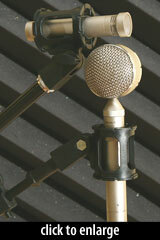 Position a Figure-8 mic sideways underneath the Cardioid, so the three capsules are as near to each other as possible. Record the two mics to separate tracks. At mixdown, duplicate the Fig8 track and invert it. Pan these two Fig8 tracks hard R/L, and group them so their faders are locked together. This is the “side” track. It’s an ambiance fader. 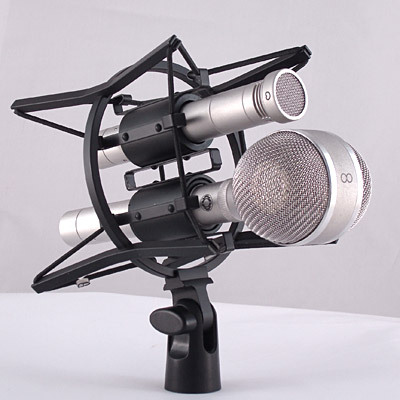 Add as much to the (centered) Cardioid track as suits the arrangement. Vary it from verse to chorus to bridge if you like. Sweet, eh? The first sample, below, is from episode 1 of The Microphone Show, in which we put the Oktava MK-012 up against a pair of vintage Neumann KM 88is, thought by some to be the finest small-diaphragm condensers ever made. It wasn’t a particularly fair “shootout,” considering that the Neumann mics bring well over $1000 apiece, if you can find anyone willing to part with them. Yet the Oktava mics sounded damn good, as you can hear below. 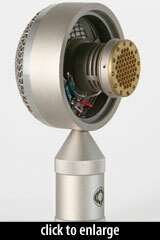 The first track is the bare Cardioid mic; below that is a stereo mix with the Oktava Figure-8 capsule blended in. The artist is Chi McClean, whose sophomore album is due soon. These tracks were recorded at Sausalito’s Loudville Studios. 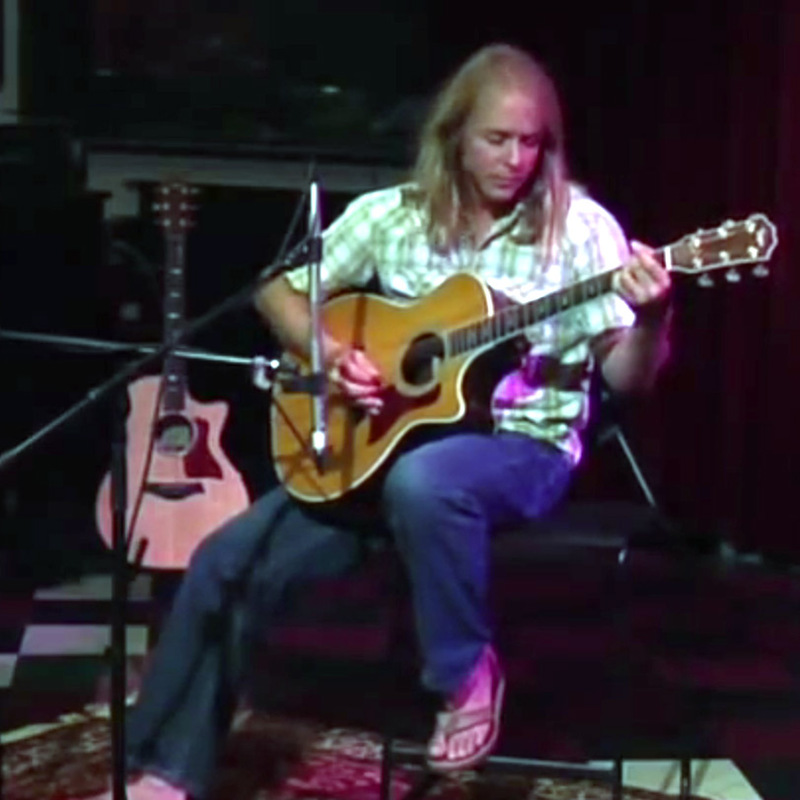 If you use a mid-side pair relatively close to the guitar, the stereo mix will pull to one side. Presumably this is because the instrument’s soundhole is louder than its neck, so one side of the Fig-8 capsule is getting a lot more signal. If you need a perfectly centered stereo track, pull the MS array farther back. That’s what we did for this second example. The mic array was about 2.5 feet away and pointed right at the body of the guitar. 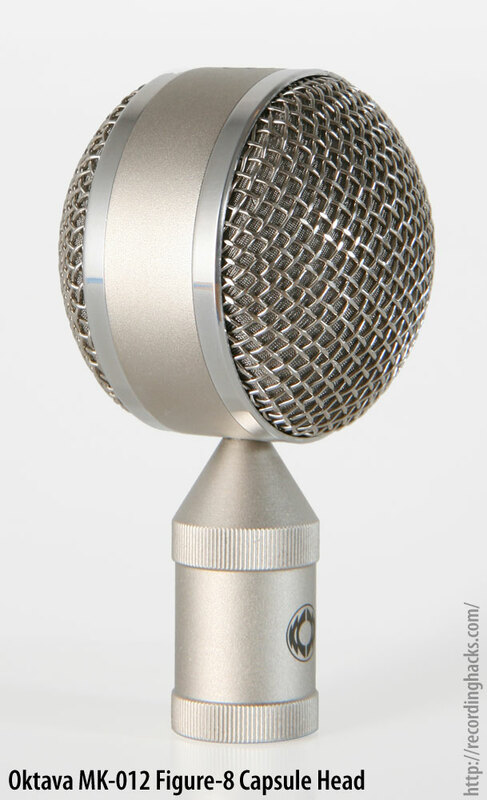 As above, the first clip is the Cardioid mic alone; the second is the stereo MS mix. The artist in this clip is Michael Capella. The mono Cardioid mic already sounds more roomy, due to its distance from the source, but the stereo track brings in another dimension. It’s not lacking for articulation, but there’s a great sense of space that’s not present in the mono recording. This is a great option to have at mixdown. And remember, with Mid-Side you can vary the amount of ambiance, simply by moving the “side” fader up or down relative to the “mid” channel. If you record acoustic instruments with the MK-012, you’ll find this Figure-8 capsule a great addition to your toolbox. It’s compact, making it easier to position than many large-diaphragm multipattern mics. It pairs well tonally with the MK-012 Cardioid capsule. And it takes advantage of the head amplifier you already own. I’ve grown to love using Mid-Side on acoustic instruments, and this capsule has given me a really simple way to do it. Every coincident stereo mic technique is significantly easier if you can put both mics on a single stand. This is true for ORTF, XY, and Mid-Side. When you have both mics on a single stand, you can easily reposition the array. If you’re using two stands, you’re doomed to incessant fiddling to maintain the relative positions of the two microphones. Like the Sabra-Som SSM-1 Universal Shockmount I reviewed a while back, the S-Grip is a compact problem-solver. It’s a great thing to keep in the toolbox, and will find its way into more sessions than you expect. 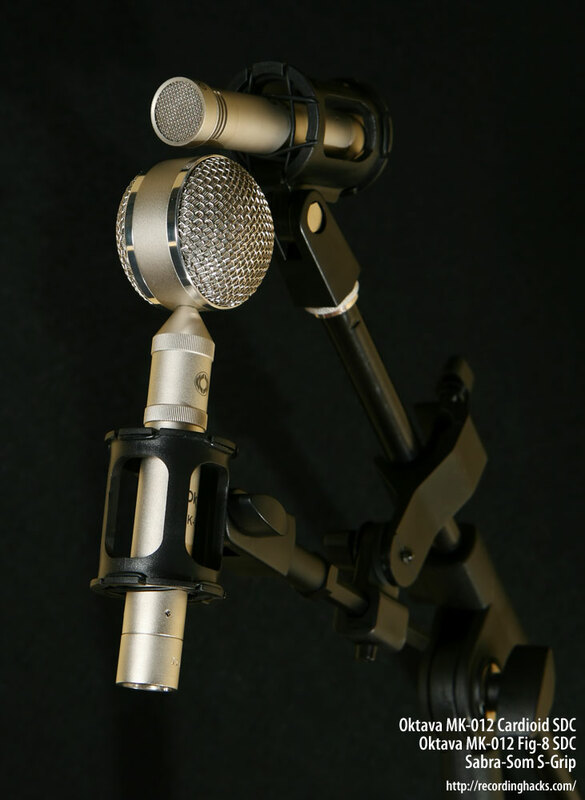 Another cool option is Oktava’s dual shockmount, the SM-MSR, which holds a pair of MK-012 bodies for XY, ORTF, or MS applications. Out of the box, it’s great for MS, as pictured. For XY and ORTF, you’d need a couple of the swivel-mount capsule adapters too. I believe the only place to get the Oktava capsule head is direct from the Oktava-Online Store. The S-Grip is easily found at any of dozens of Sabra-Som dealers around the world. The S-Grip was loaned to me (with some other Sabra-Som goodies) by the fine folks at Trans Audio Group. Thanks to all of them for their support, and to you as well for reading the meandering fine print at the end of this review! If you have any questions about the Oktava capsule, or tales of triumph and glory following the use of Mid-Side on acoustic instruments, please leave a comment below. Hi thx. So you were using the two mikes 1 cardiode as the centre channel and another one but with the ms capsule for the two sides right ? If this correct how does the cabling for the second mike work ? 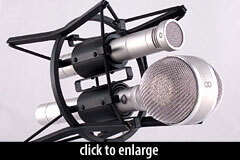 Matt, all figure-8 microphones use a standard 3-pin XLR cable, just like Cardioid or Omni. 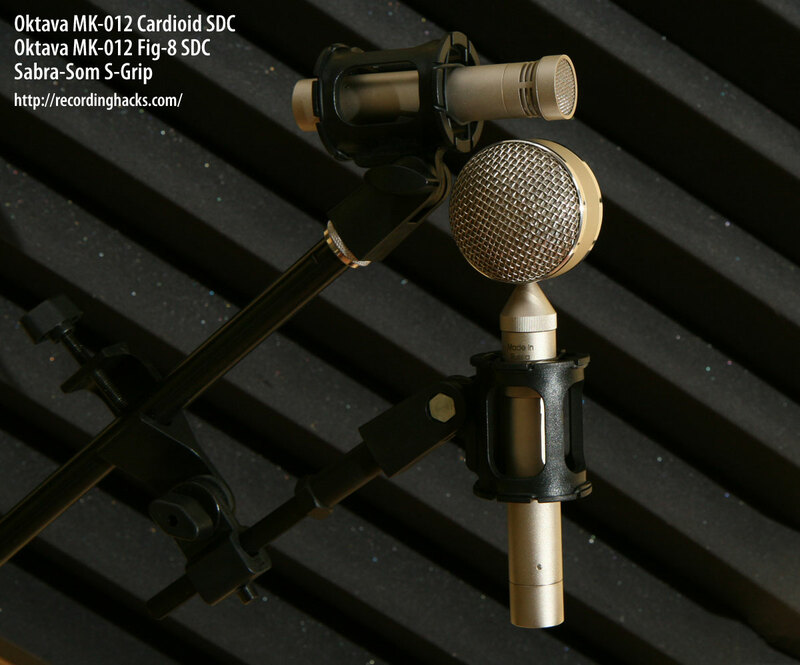 To produce Mid-Side from this pair of mics, you’d need to build a 3-channel matrix in your mixer; follow the link in the article to the “microphone show” for more info on that. It is perfectly true that phase anomalies would be an issue if the two mics were combined into a mono track, but not if they were panned hard left/right. Using M/S as a “superior” alternative for stereo recording seems odd since all of the side signal will dissappear completely if the track is monoed. Or have I misunderstood something? @Andrew, you cannot assume that playback will always occur in stereo. Therefore, your hard-panned stereo recording might be summed to mono by the listener, who would thereby experience a significantly different mix than you intended. When an M/S track is summed to mono, the side channel indeed disappears, but the instrument would still be heard clearly due to the Mid channel. ANy comment on pros and cons of the adapter vs the figure 8 head … ? The space between membrances could be an issue … i am thinking of using an MS build with Oktavas (I have one stereo pair and I am thinking of bying eihter the adapter and one Mk12 alone, or the figure 8 head). Does anyone know if there is any USA source for these? Capsule spacing on the T adapter version I own appears to be about 70mm, so significantly more than a KM-86. Curious if it’s less on the dedicated lollipop head. 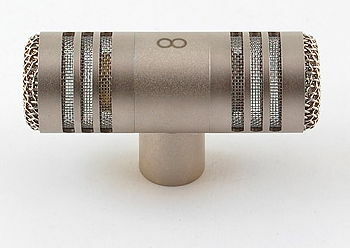 The spacing can make for some odd artifacts as compared to a dedicated single element figure 8 like a ribbon, Sennheiser MKH30, or Neumann KM120. 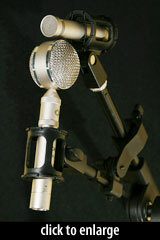 Great review, I am on the look out for a double MS rig to record ambiences in the field using a small figure 8 mic. Thanks!